If you have a dual-battery system, and run a fridge and other power-draws in remote places, you are going to have to invest in solar panels. A day’s driving will help top up your second battery, but unless you are near a 220V source, when you are parked for any length of time the power drain is going to kill your second battery within a day or two. There’s plenty of choice out there on the solar front − from large panels that can be fixed permanently to the roof of your trailer or van, to various more mobile units that can be rolled out or unfolded in the campsite. Each has its advantages and downsides. Fixed panels, although highly convenient and “always on”, can be damaged, and you have to keep parked in the sun: not ideal. Flexible panels are becoming increasingly more efficient. They are thin, can be walked on, and can also be permanently mounted. We have a slightly different version on test here, made by TBV Solar. This 160W unit consists of four flexible panels (1700mm x 565mm when folded out) that are sewn into a strong and durable 600 Denier nylon camouflage backing. 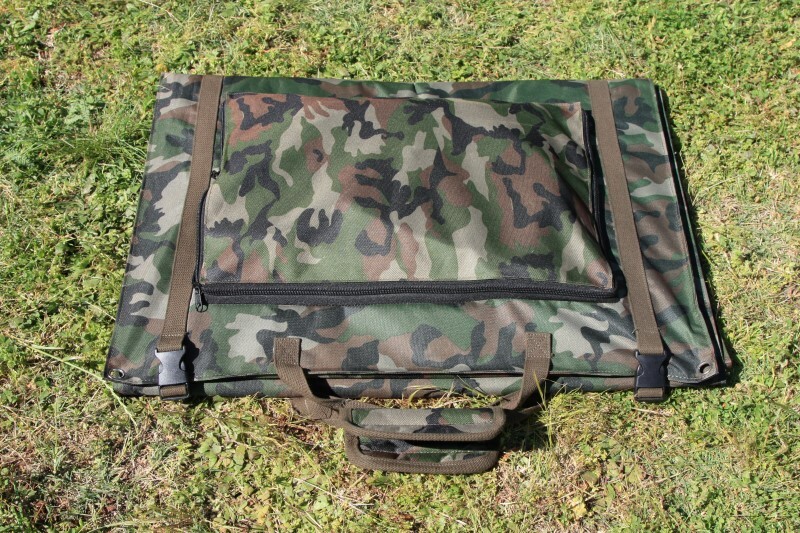 It can be folded up quickly and easily to form a lightweight 565 x 440mm carry case. TBV Solar makes up a variety of panels kits with different outputs: 40W per panel, from 120W (three panels) to 250W (six panels). Purchase according to your power needs. The durable backing means that the panels are properly protected when they are being carried about, and their total weight of 3.3kg is negligible. 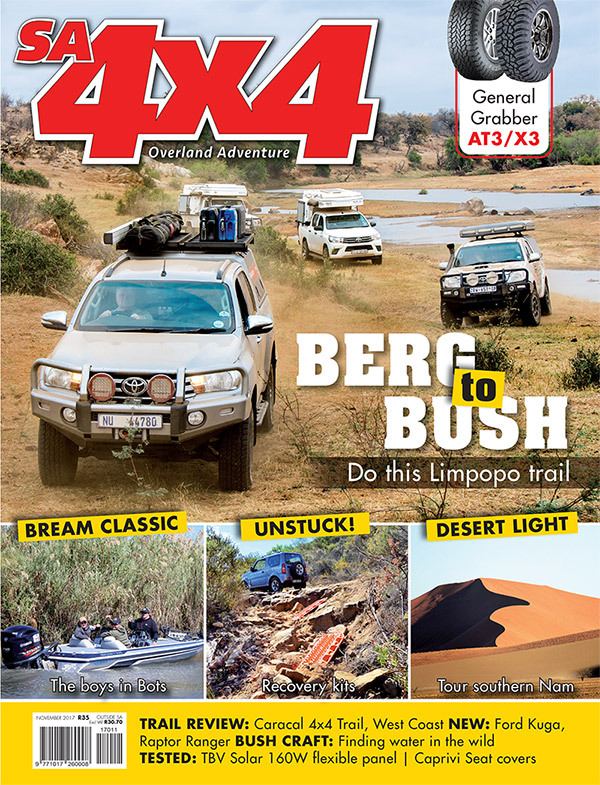 As the four-panel unit is just 50mm when folded, it can be stashed behind a seat, or between other items such as mattresses, making it the perfect overlanding companion. The panels are flexible and tested to withstand a 227g steel ball dropped from a height of 1 metre, and winds up to 60 m/s. 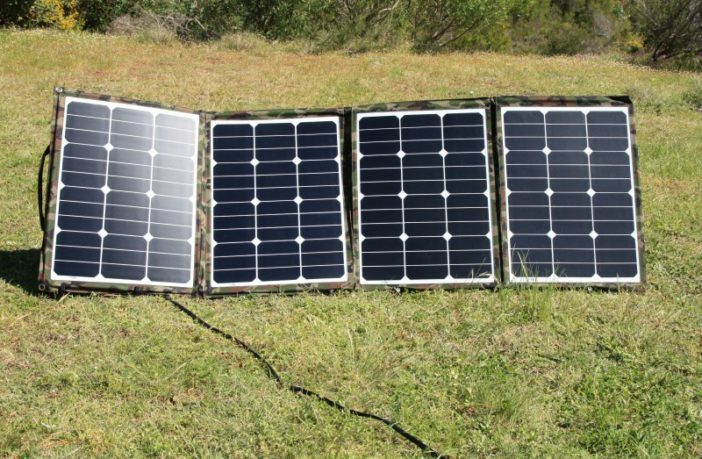 To set it up, simply haul it out, unclip and fold out the panels, plug the Brad Harrison plug into your dual battery controller input side, and position it in the sun – anywhere within the 10-metre reach of the supplied cable. Part of the package includes three aluminium stands that can be assembled if there is nothing to lean the panel against, though these work best when there is no wind. During testing, I found that the panel can just as easily be laid out against a tent side, on top of a canopy, or simply stretched out on the ground – whatever is optimal for catching the sun’s rays. The eyelets in the corners mean that it can be tied down if conditions are windy. The integrated controller regulates output voltages and includes two outputs: a pin-type 12V outlet for charging small electronic devices, and a 5V USB outlet for charging mobile phones and the like. The total claimed voltage at maximum power is 19.8V, and the current produced is 8.08 Amps; in practice, I measured typical outputs of 13.11V. The claim is for an ideal-case efficiency rate of 21.4%, which is excellent, but will obviously vary depending on the weather. How well does it work in the field? I conducted a chargeup test in full, consistently sunny conditions on a 115A/h deep-cycle battery that had powered a fridge and LED lights overnight. At 08:00, the battery was at a very low 89% charge (12.64V) when sun first reached the solar panel. With the power draw consistent (fridge and lights), by 10:30 the battery was at 93% (14.66V), by 11:00 at 96% (14.65V), and by 13.30 registered 100% on the C-Tek D250S system’s battery monitoring app, with the voltage now cycled down to 13.71V. In other words, a full charge in just over five hours. I found this to be a well-made, robust, easy-to-use product of high quality that can be set up fast and efficiently, and which provides the power it claims to produce. Its self-contained carry case with handle is convenient, and takes up little space. The two outlets built into the solar controller mean that other devices can be charged in addition to recharging a battery. It feels as if it will deliver years of reliable service. TBV Solar makes both solid and flexible solar kits of various outputs. This company works on a courier-delivery basis, and offers a two-year warranty on its flexible kits and a one-year warranty on the controller. The four-panel unit that was tested retails at R8680, and the six-panel 250W unit is priced at R12 230.